There was a small table with a pitcher of water and two glasses on the stage, two chairs on either side of the table. The talk's moderator, New Yorker Fiction Editor Deborah Treisman, sat on the one side. Haruki Murakami, his legs crossed, sat on the other. He was wearing a creamy beige suit over a white t-shirt so washed-out the Tide laundry detergent brand in the dead centre of his chest was almost as white as the T-shirt. His shoes, like a narrator from one of his novels, were very faded red sneakers. His hands were in his lap and he spent much of the afternoon's talk looking down at them. When he looked up, to punctuate a point, say, you saw the full colour in his cheeks. He is in his late fifties, but all his marathon running and highly, highly disciplined life show in his glow. He looks healthy, happy. You can't fake humility. You can think you can, but you can't, and Murakami was not faking it, and this is a guy touted to win the Nobel Prize. It's not that he is so daft as to not realize how big a literary celebrity he is. But nor does he do as I'd seen the writer Jhumpa Lahiri do at a New Yorker festival event two days previous - so overwhelmed by her fame as to selfishly reject it, playing that celebrity 'I hate that you love me' game (a rather lousy move to an audience of people who've paid to see you, and who just want to come up afterward to shake your hand and thank you for what you've given them). Murakami wasn't rejecting it because he doesn't take himself or his status so seriously as to allow that to be a central issue of his life. Previously, I wrote on my being mentioned in the New Yorker's blog on this very talk, and included the blog itself. It highlighted many of the anecdotal threads of wisdom the famous novelist had to give. But the blog, in its probably strict requirement to be pithy, couldn't capture the whole thing (and maybe few people other than hard-core Murakami nerds like me care), but I feel the need to add a little, like the ambience in the packed theatre that the man created. 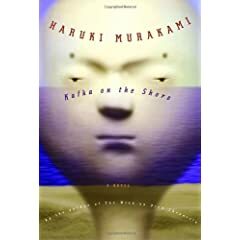 Online the New Yorker mentioned Murakami outlining harmony as one of the three essential elements in his fiction. What wasn't mentioned was the balance this man gives off not just in his prose but in his presence, the way he sits, the way he takes his time to think over a question; a long time before he will start to speak; an act he also is in no rush to babble through. Murakami does not babble. This is a guy who drinks little, is early to bed and incredibly early (as early as 3am) to rise. He described all of his working endeavours, including writing, translating and revising, as fun. That he used the word 'fun' was mentioned. What wasn't was the number of times he said it, and how childlike-sincere he seemed to be when he did. As well there was an audience member's astute observation that reading Murakami is a calming experience. That's why millions around the world are reading not one but all of the guy's novels. This not to say his novels are without their darkness. They almost all delve deeply down the dark well. Yet even in the digging there remains a kind of serenity. Murakami so embodies a spiritual calm it all but changed the way we audience members breathed for a couple hours of a Sunday afternoon (I don't even think I'm exaggerating). Though he never discusses religion, and as far as I know is not in any way a religious man or even affliated with any religion, I think his grandfather (or was it his father?) was a Buddhist priest. This doesn't seem coincidental. Speaking of Buddhism, I doubt I am the only person to walk away from watching their favourite living writer wishing that they too could diminish their ego to that degree.